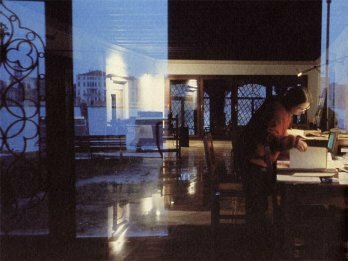 In the spring of 1993 Luigi Nono’s heirs rented two spacious rooms in a 16th century palazzetto, recently restored and protected against flooding by high tides. The building, known as Palazzo Foscari, faces the house in which Luigi Nono was born, across the Giudecca Canal. One of the rooms contains the archival collections and office equipment including a color laser copier, used for reproducing manuscripts (acquired thanks to the generosity of the publisher Casa Ricordi and Office Tecno Service, Venice). The other room serves as a reading and listening room, or for public events. All visitors have access to the recently acquired books and current secondary literature, as well as the computerized catalog of the archival holdings, all situated in this room. Audio and video equipment (donated by Sony Classical Europe) is also available for visitors’ use. The Association was established in December 1993. The Archives receive some financial support from public institutions (Ministero per i beni e le Attività Culturali, Sopraintendenza Archivistica per il Veneto, Regione Veneto) and from international sponsors, but relies also upon private donations (in particular from the Friends of the Luigi Nono Archives) and upon help by volunteers and interns. The Archives are open to anyone who wishes to deepen his/her knowledge of Luigi Nono’s works. Students and musicologists who would like to carry out extensive research projects in the Archives are requested to send in a short description of their projects, the length of time they expect to spend in the Archives and a curriculum vitae, so that their visit may be planned in advance. We welcome interns (volonteers) who wish to gain experience in the management of music archives. «The founding of the Luigi Nono Archive, which we owe essentially to Nuria’s intelligence, to her ability for organization, but above all to her devotion, represents one of the most important cultural initiatives in Venice in the past few years. It is so much more than a matter of paying due “homage” – which is certainly proper – to the Figure and to the works of our great composer; it is a meeting place, a place for research and for studies on contemporary music, in all of its complexity and its frontier experiences. The Archive is the living trail which traces the depth and the vastness of the problems which Gigi had to face: those problems which great music of our time must face in order to give a form to its own particular language and in order to succeed in advancing, even on its own specific territory. The Archive is the image of that laboratory, of that inexhaustible process of “experimenting”; of that “journey”, which are the works of Nono – of his generosity, of his never futile “curiosity”, of the wide-openness of his way of listening. It will be impossible to comprehend Nono’s Work without being acquainted with this Archive. Just as it is impossible to know contemporary music without listening to Nono.